Everything about it has gone upwards and onwards – not to stardom, but to a level where the fans are breaking ground crowd records, and the overseas imports have been stepped up a level. Some might say scripted, but whatever the reason, BBL|04 has absolutely thrilled on more than one occasion. From teams like the Melbourne Stars clawing their way back from the bottom to make the finals, to the Adelaide Strikers cleaning up all before them, and some spectacular catches and 100+ metre sixes to boot, it’s safe to say the KFC Bucketheads, dancers and music blend in with the spectacle now, rather than being front and centre. 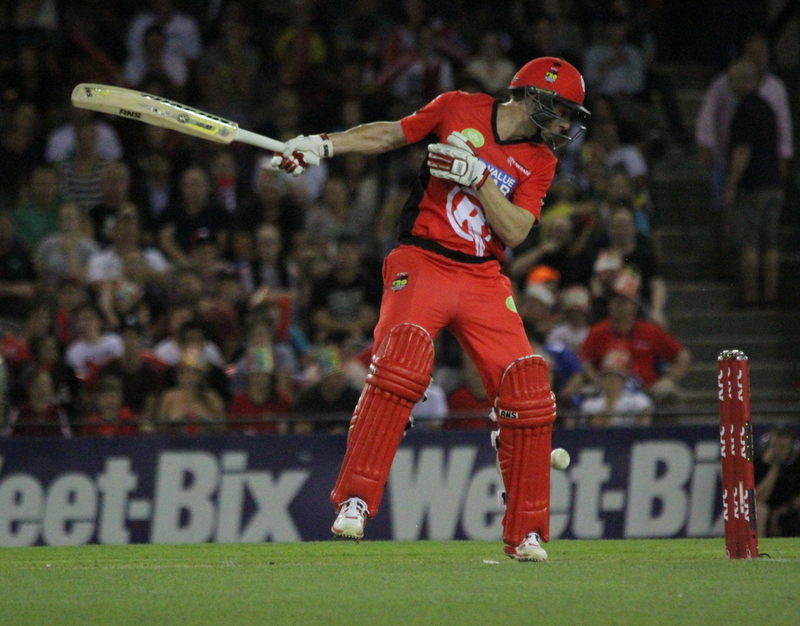 Trying to cultivate a list of BBL|04 moments is easy, with plenty every game. Culling that list to just a few is a different question. Before the final, here are some moments of a highly successful season, for the fans, the teams, the audiences, and the records – in no particular order. After two seasons languishing at the bottom of the ladder, the time to turn the tables was now, in BBL|04. 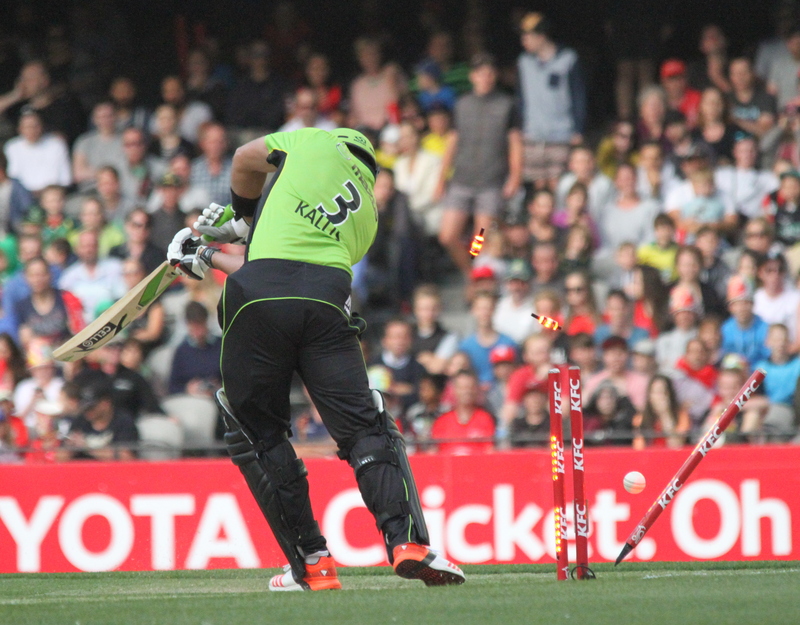 Michael Hussey and Jacques Kallis did just that, much to the delight of the Thunder fans. It wasn’t a slogfest, it was pure batting from a master and legend of the game. While it may sit 41 runs behind the highest partnership in Twenty20 domestic history, it’s the second highest in BBL history. Add to that it was Hussey and King Kallis, and you have a pretty special moment. Needing 56 off 6.1 overs, the Stars looked down and out after Kevin Pietersen fell with the score on 3-95, and Glenn Maxwell just 13 runs later. The Sixers kept the bowling tight, and the Stars couldn’t find the gap. It was the 27 runs in the last two overs that got them to the super over, and the Sixers couldn’t believe. James Faulkner and Luke Wright then put on fireworks no-one was expecting. While the super-over was frenetic, the overs before it whipped a crowd of 22,000 into such a state it sounded like 50,000 were at the ground. Maiden over enemy to bowling maestro, Tye convincingly won the game for the Scorchers. The key stat in his figures of 4/18 were 13 dot balls, and if anything was liquid gold in Twenty20, it’s no runs scored. 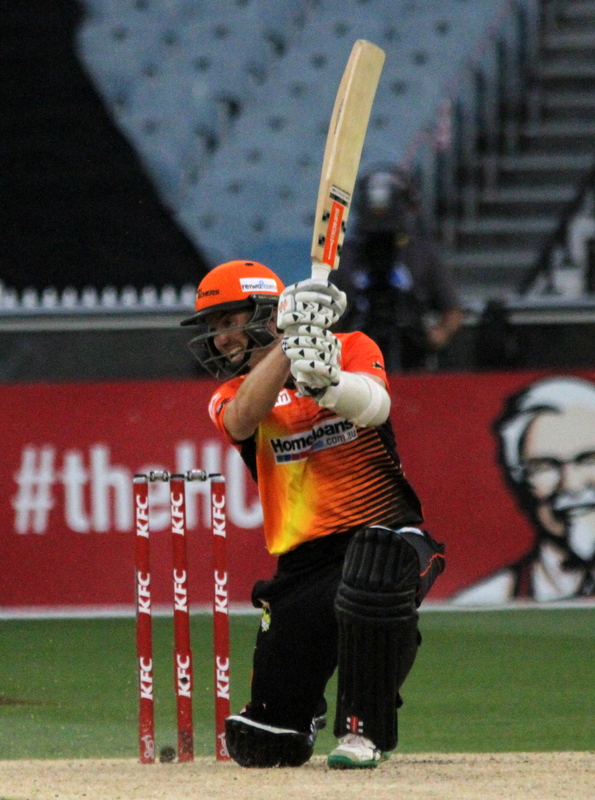 Tye looked like he was holding a handle bat no bat in the final over of the Scorchers innings. Then he struck; first it was Luke Wright, c Voges b Tye. Four balls later, it was Handscomb, out to the same combination. John Hastings (22) was the key wicket; when he was bowled Tye had essentially won the Scorchers a game which they had grasped back control of. Was it a catch? Was it a six? The final answer is it was an absolute thriller. Unbalanced, with the ball sailing over his head, Lalor had enough poise to tap the ball up into the air while in play – then wobbled over the boundary line, jumped off outside the field of play while the ball was still in the air, and landed inside the rope, with the ball pouched. The resulting TV footage afterwards, with Stars skipper and victim of the catch, Cameron White, discussing with Malcolm Conn on the boundary how it should have gone. It still goes down in BBL folklore. Fresh from being demoted back to the BBL from the Australian test squad, Starc’s 4 over stint yielded 1/36 – but it was the ball to dismiss Kallis that had the Sixers supporters absolutely roaring. Sending in a 145 kph yorker, Starc had Kallis’ middle stump uprooted, and then took out stump cam in the process. While Starc might have been bettered in the best bowling category by the likes of Tye, Jason Behrendorff and perhaps James Pattinson, his delivery certainly sent waves to the Australian selectors. Across two matches between the teams this season, almost 800 runs were scored overall. Jimmy Peirson (57 off 35) had his “coming of age” that night, with some clean hitting that even Viv Richards would have been proud of. Second tier sixes were the norm. The crowd was loving the big hits. It may not have the spectacle of one fantastic moment, but is worth a mention purely for the scores. It was the ball that had Adam Gilchrist and Damien Fleming in the commentary box with mouths open like they were on hinges. Ryan Duffield delivered what is now a ball for the ages – all because Glenn Maxwell shouldered arms. It was fast, it was swinging in, and it pitched around middle and leg. Maxwell’s movement to charge Duffield, and most likely try and hit him over the top of cover or mid-wicket, backfired. Even Stars fans were left stunned and nonplussed by the bewildering movement. It was the match of the tournament pre-Christmas, in front of a sell-out WACA crowd and some very, very vocal Perth fans. 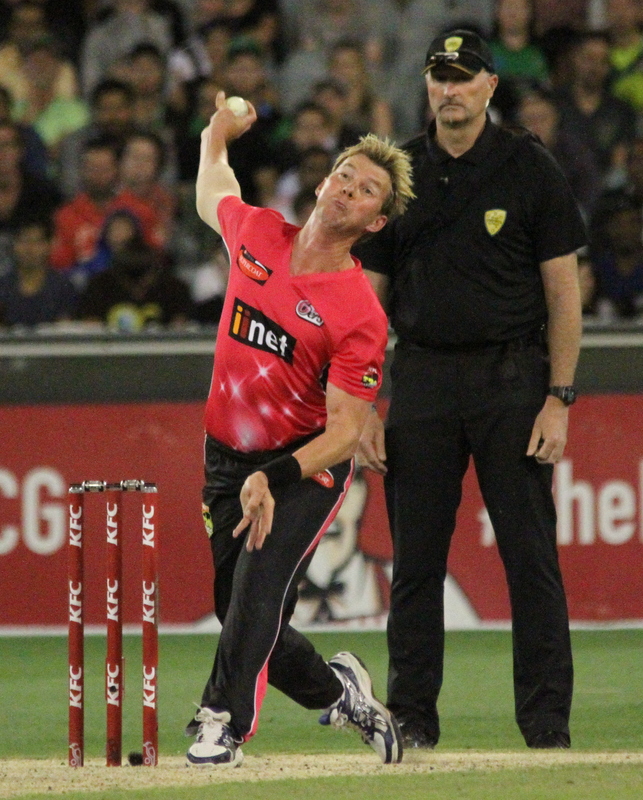 With no-one left in the tank, Adam Zampa came out at 8/126, with the Strikers needing 21 off 13 balls. The Scorchers had bowled extremely well to restrict the Strikers. No-one expected Zampa to rip out what is one of the cleanest sixes of the tournament, belting Yasir Arafat onto the hill at the WACA. As soon as he hit it, “he knew it” were Zampa’s words. With such a strong record at the WACA, the crowd was absolutely stunned as Zampa launched the maximum. That moment also emphasised the depth and grit of the Strikers, given the state of the game where everyone was still on Perth to bowl Adelaide out. Before Lalor, there was Silk’s hands. Chris Green’s innings for the Thunder ended abruptly as he skied a ball that would have punched through the Etihad Stadium roof. Running in from the boundary at full pelt, in a desperate attempt to snare the catch, was Jordan Silk. Despite an imminent potential collision, Silk pulled off a fully outstretched “dive ‘n slide” to complete a duo of incredible catches for the night. Crucially, he never took his eyes off the ball, and his reaction afterwards said it all. Amazingly, both centuries scored in BBL|04 featured matches the Scorchers played in. Only one of them was scored by a man in orange though; Michael Klinger. The Renegades bowling attack was grossly undermanned, and Klinger took full advantage, smashing 105 off 60 balls in a century dedicated to the late Phillip Hughes. Such is his experience that Klinger’s innings looked flawless, with seven boundaries and four maximums. He culminated his innings with a towering six off Andrew Fekete. Peter Handscomb’s innings was a whole different ball game. His 50 came off 45 balls. From 55-103 took just 19 balls – a strike rate of almost 300. No-one else scored over 20 for the innings. Handscomb’s last six deliveries were: 1 1 1 6 2 6. Unlike Klinger’s innings, where he had ample support from fellow opener Marcus Harris, Handscomb was the warrior who stood tall when the men in green were down for the count. It was the catalyst for getting the Stars to the finals, and the beginning of Handscomb’s true acknowledgement among the Melbourne fans. While ground records were broken throughout the competition for attendance, the Strikers breaking the AFL record of 52,500 – getting 52,633 through the gate for their semi-final against the Sixers – emphasises the growth of the competition and the support for Adelaide at home.